The desert may be inhospitable, but it is far from sterile. While the brawl raged on between the Racquet Club and the Tennis Club in Palm Springs, a new champion emerged in the East Valley. Inseparable from its architects, a historic home blushes pink and turns heads. Nostalgia and a day in the sun. Photographys by Dewey Nicks; Styled by Katie Bofshever Segal; Story by Emily Chavous. No matter where you drive it, the Rolls-Royce Dawn is like being in heaven. Barry Nadeau makes his customers feel like kings and queens for a day. While a roast pig is the centerpiece at this chef’s alfresco feast, it’s friends and family who steal the spotlight. 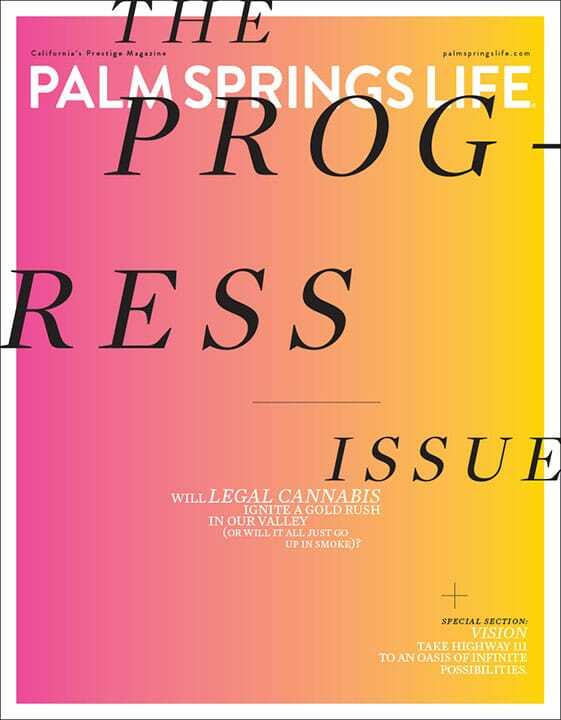 Palm Springs Life presents the official annual guidebook of the Greater Palm Springs Convention & Visitors Bureau. Everything you need to know about what’s happening in the desert. Presenting the best the Coachella Valley offers in fashion for people and the places where they reside. The Coachella Valley’s top professionals.